Maruti Suzuki India Limited has launched the limited edition Wagon R Felicity at Rs 4.40 lakh, ex-Delhi. The price is approximately the same for the lower trims while the top-end Vxi (O) AMT Felicity is priced at Rs 5.37 lakh, Rs 13,500 more than the equivalent trim. The company hasn't announced a date when sales of the Felicity variant will no longer continue. Maruti offers the Wagon R Felicity in Lxi and Vxi trims and one can also order the car in CNG option as well. The Felicity isn't available with the Wagon R Stingray though. The Wagon R Felicity gets a host of cosmetic upgrades from the regular car. This includes reverse parking sensors with display and voice guidance and a 2-DIN Bluetooth-enabled music system with speakers. In addition to all this, it also features PU seat and steering cover, body graphics and a rear spoiler. The limited edition comes in manual as well as automatic transmission options and is powered by the proven 69PS 1.0-litre petrol engine. 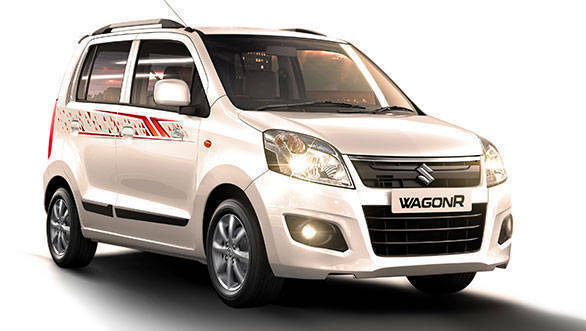 Earlier this year, Maruti Suzuki introduced the Wagon R and Stingray with AMTs. Dual airbags and ABS were also made optional right from the base trim. In the wake of fresher competition in the form of the Tata Tiago and other cars, Maruti hopes the the Felicity edition will attract more buyers to its showrooms.